A couple of weeks ago we covered Royal Bank of Canada (TSE:RY) and this week we will take a look at Canada’s second largest bank Toronto-Dominion Bank (TD). TD has over 10.2 million online and mobile customers. Unlike RBC, the company operates solely in North America and has segmented operations into Canadian Retail, U.S. Retail and Wholesale Banking. The Canadian Retail segment provides a range of financial products and services to customers in the Canadian personal and commercial banking businesses. The U.S. Retail segment consists of its retail and commercial banking operations operating under the brand TD Bank, and wealth management services in the United States. The Wholesale Banking segment provides a range of capital markets, investment banking, and corporate banking products and services, including underwriting and distribution of new debt and equity issues, providing advice on strategic acquisitions and divestitures, funding and investment needs of its clients. Let’s take a closer look at why TD makes a good investment. TD is Canada’s number 1 ranked bank in terms of important metrics such as Total Assets and Deposits and ranks 5th in both of these categories in North America. With both the Canadian and US economies showing signs of strength, TD is well positioned to benefit as they have a strong focus on retail banking which will be discussed later on. Each year, Canadian Business magazine releases a list of the TOP 25 brands in Canada based on a national survey that asks Canadian consumers for their opinion on which brands are winning their hearts, minds, and wallets. This is not simply a list based on market capitalization, but an analysis of brands that are truly resonating with customers. In 2017, TD was the top ranked bank coming in at #11 after jumping an impressive 6 spots from ranking #17 in 2016. Over the past number of years, TD has managed to consistently grow earnings despite the continued skeptics’ negativity around the Canadian banks ability to do so. 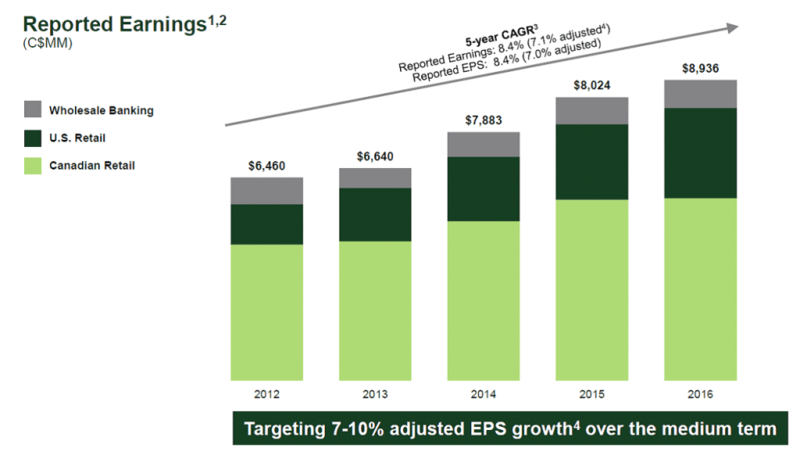 TD has a targeted adjusted earnings per growth of 7-10% over the medium term, which is in-line with the growth experienced over the past 5 years. This is comforting for investors, as their ability to deliver historically leads to confidence in their ability to deliver in the future. Much like RBC, TD has a long history as a reliable dividend payer. 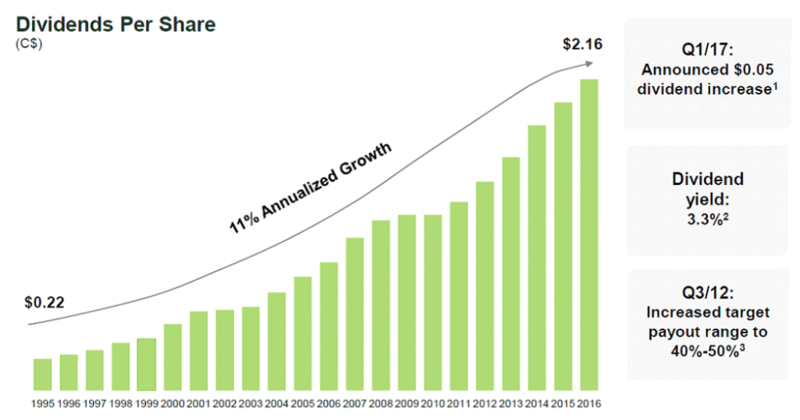 As you can see in the chart below, TD has a stellar dividend record and was able to maintain their dividend during the financial crisis. The company returned to growth in 2011 and has since raised steadily over the past 6 years. This past April, they announced a quarterly dividend raise of C$0.05/share, which was the highest among all Canadian banks thus far in 2017. Likewise, their 3YR (10.1%), 5YR (10.6%) and 10YR (9.3%) are the highest growth rates among all of Canada’s top 5 banks. TD currently has a targeted dividend payout ratio of 40%-50% and the good news is that their current payout ratio is sitting comfortably in this range at 47%. As a result, there is ample room for growth over the medium turn and investors can expect dividend growth rates in-line with EPS growth. In 2017, rates both sides of the border have moved to the upside and TD is the bank best positioned to take advantage of rising rates. Rising rates are a boon to banks as they have a positive impact on banks net interest income (NII) margins. One of the reasons TD is poised to benefit more than most is that they have a clear retail earnings focus, with over 80% of earnings coming from retail. As a result, these rate increases could impact TD in a meaningful way. Through the first 6 months of 2017, NII accounted for 58% of revenues. The best part is they have been able to grow loans and deposits organically, which combined with rising rates should lead to outsized returns for the company. Based on current margins, 25 basis point rise in interest rates could equal an additional C$75 million in earnings or C$0.04/share. TD has historically been regarded as one of the best banks in Canada. They have a strong brand, loyal customers and have demonstrated strong financial performance over the years. At first glance, TD may look expensive as compared to the other Big 5 banks as their P/E of 12.74 tops the group. However, investors should be aware that on a historical basis, TD has consistently demanded a premium over their rivals. TD is a premium bank deserving of its premium valuation, and investors will be well rewarded for their investments in the company. As always, investors should have a clear understanding of their own risk profile prior to investing and are encouraged to do their own due diligence.